Monday December 15th 1924 Fannie not able to be up till dinner time. I knit on my bag. Had letters from Lizzie Lindley and Birdie. Went to town in taxi at four PM. Rode home with Ott. weather pleasanter. 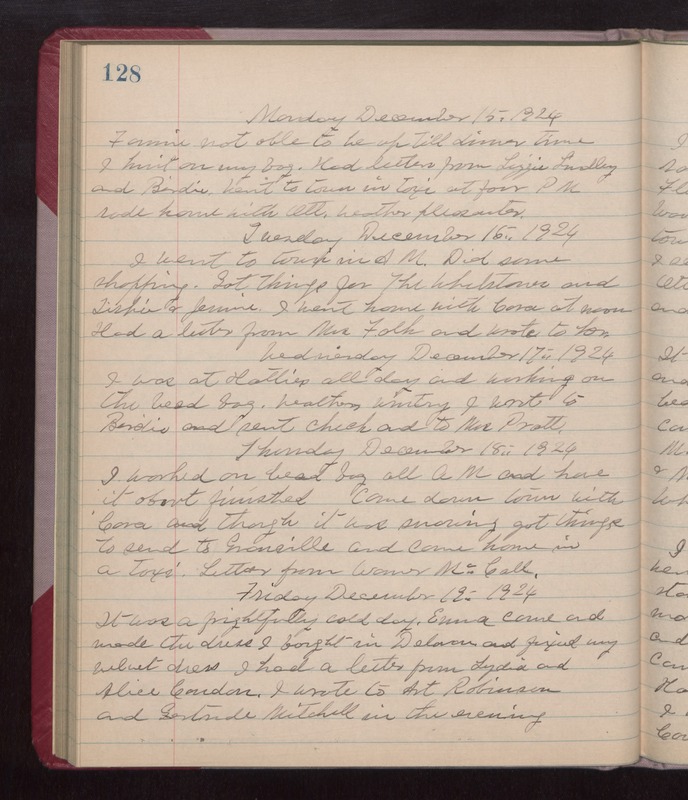 Tuesday December 16th 1924 I went to town in AM. Did some shopping. Got things for The Whetstones and Tishie & Jennie. I went home with Cora at noon. Had a letter from Mrs Falk and wrote to her. Wednesday December 17th 1924 I was at Hatties all day and working on the bead bag. weather wintry. I wrote to Birdie and sent check and to Mrs Pratt. Thursday December 18th 1924 I worked on bead bag all AM and have it about finished. Came down town with Cora and though it was snowing got things to send to Granville and came home in a taxi. Letter from Warner McCall. Friday December 19th 1924 It was a frightfully cold day. Emma came and made the dress I bought in Delavan and fixed my velvet dress. I had a letter from Lydia and Alice Condon. I wrote to Art Robinson and Gertrude Mitchell in the evening.